Mould! The word itself strikes fear in the hearts of residential and commercial property owners. Mould infestation can be nasty and often expensive to eradicate completely, especially when left untreated too long. But knowing the different types of mould that are common in Canada may help ease your worry—and bring you some new insight into the process. Cladosporium. This is a common mould with over 500 known species in existence. Wow! Coming in a variety of colours including black, brown and green, Cladosporium can be found both inside and outside your home. The spores from this kind of mould can become airborne, and that’s how it can spread so easily. Growing in warm, damp areas, it’s likely to appear in places like your bathroom, basement, or near your HVAC system. Health problems that arise due to this type of mould are usually compared to allergy symptoms and include itchy eyes, a runny nose, and coughing. Penicillium. It sounds a lot like penicillin—and for good reason. This type of mould was accidentally discovered to be capable of producing a compound that could inhibit the growth of bacteria. That’s how the medicine was discovered. Found all over the world, this type of mould tends to be blue or green in colour. It is commonly found in both the air and in soil, though it tends to grow best in damp weather conditions. Indoors, penicillium mould is usually found on damp building materials like drywall and wood. This is also a type of mould often found on your spoiled food in the refrigerator. While it can be dangerous because of the mycotoxins produced, this type of mould also benefits us. Aspergillus. It’s pretty much impossible to avoid this type of mould because it is everywhere. Found both indoors and outdoors, it doesn’t tend to be harmful to people unless they have health issues. In fact, out of nearly 180 species of this type of mould, it’s thought that less than 40 have been known to cause us trouble. Aspergillus mould tends to thrive in the ground, but its spores are so small that strong winds easily transport them up and away, which is why the mound is so common. We probably breathe in hundreds of these tiny spores every day, and for generally healthy individuals they’re nothing to be concerned about. Alternaria. Wondering what causes all of your fall and spring allergies? Alternaria may be the culprit. These spores tend to be at their most dense during the dry, windy season—perfect for helping the spores get airborne. It’s most often found outside your home, but if it did get inside it’s probably because you had your door or windows open on a beautiful spring or summer day. This species of mould can be potentially dangerous to humans, causing everything from allergy symptoms to asthma attacks. Heavy exposure is not recommended for safety reasons. There are many types of mould in the world. Each one affects humans—and structures—differently. 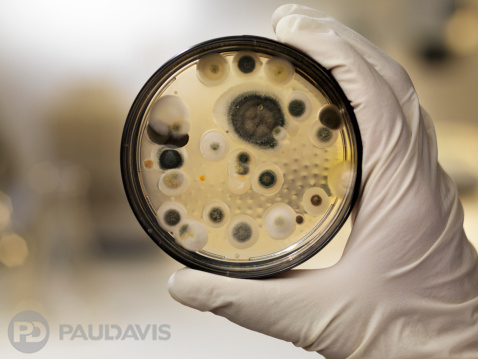 If you ever suspect that mould is causing problems in your home, call the experts at Paul Davis. Because if mould is your problem, This Is No Time For Second Best™.